I just finished up my presentation on data marketing at the Web 3.0 Conference, and I thought I’d share it here as well. I’ll recap what I said to accompany the above slides, a kind of running commentary like they have on DVD’s. I’ll put slide numbers in brackets, like  for slide #4, so you can follow along. I want to talk to you about  the emerging field of data marketing. Web 1.0 was about linking pages. The giants that emerged out of that wave included Google and Yahoo!, who took advantage of those linked pages to help us find great content. Web 2.0 was about linking people. Social networking exploded, from sharing photos on flickr and videos on YouTube, to connecting with our friends and colleagues on Facebook, LinkedIn, and Twitter. By “data,” I mean the technologies of the semantic web and the linked data movement. 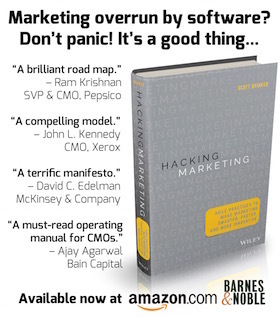 By “marketing” , I mean the broadest definition of the field. Marketing includes the 4 P’s: product, pricing, placement, and promotion. Product includes the design of your offerings and your strategy for differentiation. Pricing covers not just “the price,” but how your pricing evolves over time and how it changes for different segments and bundles. Placement is the channels by which you deliver your product to market: distribution, retail, e-commerce, partnering. Promotion includes advertising, branding, PR, sales promotions — online this means web sites, email, search, and social media marketing. Linked data will impact all of these . Web 1.0 brought us web marketing and search engine marketing. Web 2.0 brought us social media marketing. Web 3.0 will enable a whole new marketing paradigm, data marketing. I’ll touch on 4 data marketing topics in this presentation . Let’s begin with the big picture, thinking of data for customers. Data helps us make decisions . Data helps us impress our boss . Data helps us persuade people . Data is the fuel of the 21st century . Yet despite its ubiquity in our lives — particularly our professional lives — finding the data we want in any given circumstance is hard work . And then once we find it, we tend to stow it away in silos . Spreadsheets. Documents. Databases. We end up with data that is dispersed, duplicated, out-of-date, and difficult to relate from one application to the next. To paraphrase the children’s rhyme: data, data, everywhere, but not a drop to drink. But a new generation of Web 3.0 companies is working to make data “open”  — linkable and shareable. Freebase, Infochimps, Factual, Calais, Flowing Data, Wolfram Alpha. These companies are making it easier for us to find and use the data we want. But they won’t have a monopoly on linked data . The beauty of semantic web standards, such as RDF and OWL, are that they will enable any web site to publish structured data and link it to other sets of related data, anywhere on the web. Just like we all did with HTML. Linked data is the great wave of Web 3.0. Now, marketers love data . We may not be database architects — at least not yet — but we appreciate information: market research, web analytics, CRM records, social media monitoring. We know the value of good data. The essence of Web 3.0 for marketers is to think about data for customers, not just data about customers . Shift from data stalking to data talking. What data could you share with your prospects, customers, and partners to strengthen your relationships, build your brand, and win more business? One of the first places data can help is with search marketing . The web’s a big place . Carl Sagan would say, “billions and billions” of pages. Just doing a search for a specific restaurant by name in a specific city can return 80,000 hits. It can be hard for us — or our customers — to find answers. Yahoo! was one of the first major search engines to start leveraging structured data from web sites in their search results with SearchMonkey . When you do a search for a restaurant — such as “slanted door san francisco” — you might see a particularly useful summary from Yelp, right in the results. Aggregate rating, number of reviews, address, phone number, a photo of the interior. That’s a heck of a lot more useful than a random line or two of text. Google does something similar with their Rich Snippets feature . As does Bing . As a marketer, the benefit of adding search engine friendly structured data to your web site is simple: more traffic . Yahoo! reported that search results that embedded these useful snippets of structured data received 15% more click-throughs than the competition. Although the search engines claim adding structured data to your web site won’t directly improve your ranking , to prevent spammers from gaming the system with bogus data, there is a virtuous cycle here. A better listing gets you more clicks, more visitors — some percentage of whom will link back to your site, thereby improving your ranking, which in turn wins you even more clicks. To clarify, the data bubbling up in these search results was published by Yelp . Yelp is a classic example of a company that has a value proposition rooted in data. They offer extensive data about restaurants — featuring the collective intelligence of over 9 million user reviews — that makes them a data authority in the subject. The value of that authoritative brand position was estimated at over $500 million in recent M&A rumors. Adding structured data to your web site is pretty straightforward, using microformats and RDFa . If you’re not technical, just think of this as extended HTML. Embedding this kind of data in your web site is a natural extension of search engine optimization (SEO) . Whoever is doing your SEO now should be able to help with this. But since structured data takes SEO a little further, I call this SEO++ — a mix of SEO and data objects. It’s reminiscent of the paradigm shift to object-oriented programming, from C to C++. As semantic search technology advances, this will be a big deal. You can certainly take this kind of structured data further than restaurant reviews. Last year, Best Buy launched a large-scale semantic web site with their products . They used a more advanced vocabulary called GoodRelations  to more fully describe their products. GoodRelations can describe components of products, accessories, delivery options, payment options, warranties — just about anything you could want for defining e-commerce offerings in a structured format. The payoff, according to Best Buy, was a 30% increase in site traffic from organic search . This is why search is a great place to dip your toe with data marketing. It provides a clear business incentive — more traffic to your web site — and there’s an existing budget to invest in it . This year over $2 billion will be spent on SEO; within 4 years, that will be more than $5 billion. Now let’s look beyond search and think more broadly about data marketing and what it can mean for your brand . Data shapes conversations and markets. That is the essence of data branding — positioning your company through the data you create and publish — and, in a linked data world, how you relate that data to others. For example, consider Google Insights for Search . Google’s “database of intent” is arguably their most valuable asset. But rather than lock it in a vault, they let anyone mine this data for trends. With their Keyword Tool you can even drill down into specific number of impressions for all related keywords. This is smart, as it helps get marketers more engaged in search. Ultimately, this data encourages more — and more successful — search advertising. The New York Times is struggling, like all newspapers, to find their place in the digital world. But Evan Sandhaus, the paper’s resident Semantic Technologist, is forging an exciting strategy : to have the “paper of record” become the authoritative data source of record — at least for the paper’s areas of expertise with news, public figures, politics. They have over 150 years of original content to draw upon. Check out data.nytimes.com and developer.nytimes.com to glimpse this future. But they’ll have competition. Thomson Reuters also has claim to being a data authority, particularly with companies, law, markets, and finance . And they’ve got a strong competitive advantage with their Open Calais technology to help web developers leverage that data quickly and easily. CNET is a data authority with product reviews. Yelp is a data authority with restaurant reviews. Google is a data authority with search behaviors. What will your company be a data authority for? To unlock the real power of linked data, you must do more than publish structured data . You need to use vocabularies — or, more technically, ontologies — that other people will recognize and use to publish or relate their data too. The interlinked web of data is the real vision. For example, there’s a well-established vocabulary for social network data — friend of a friend (FOAF) — and a very popular vocabulary for publishing called the Dublin Core. GoodRelations, which we saw earlier, is another. But for most areas of expertise and most domains of knowledge — probably many in your specific market — there aren’t well-defined vocabularies. Yet. You have an opportunity to be the first mover, to shape the nomenclature and structure of information in your space. Reflect for a moment on the brand potential here, defining the structure of shared data as a way of shaping the use of that data in your market — in ways that are particularly synergistic and relevant to your position. Engaging in such data branding initiatives will involve a new ecosystem of players  — developers and popular data applications. Search engines are one example of a data application, but there will be hundreds, thousands as the semantic web blossoms. Smart marketers concerned with data branding will cultivate these relationships — and start soon. Finally, I’d like to mention a bit about business models for data . Implementing linked data doesn’t happen automagically. Companies need to think about how they can get return on such investments . We briefly discussed this with SEO++, but there’s a wide range of possibilities. A few weeks ago, I wrote a post on 7 business models for linked data, along with a follow-up piece on the 8th linked data business model. These triggered vibrant conversations in the semantic web community around this topic, with a number of people suggesting many additional models. Once you realize that data has tremendous value — and that the interoperability of linked data will only increase its usefulness and accessibility — you can start thinking creatively of many ways to capture that value. That’s going to be one of the great adventures in marketing for this next decade. Thank you, good luck, and let me know what you think . What happened to DBpedia re. your slides? Freebase and DBpedia mutually inclusive variants of the same thing: Linked Open Data Spaces. Remember, Calais, New York Times, BBC, and many other service providers in the Linked Open Data realm tap into DBpedia. You’re right — DBpedia absolutely should be there. My mistake. I originally started that slide with Infochimps in mind, specifically to use them as an example of a “data” company, but not a LOD company per se. I wanted to demonstrate how different ventures were heading towards a common destination from very different origins. But then the slide started to grow, and my heuristic for selecting logos broke down into a random function. I’ll make sure to give DBpedia its due credit in the next one! Hello, thank you for your presentation that s helpfull and clarify a lot the ways that companies and professionals will be concerned by the semantic technologies. Im french so i apologize in advance for my english. I ve just a different point of view regarding the page 23 titled “catalyse a virtuous cycle”. I ve writed a doc for one of my client to answer to his question “why is it important to consider SW for our referencement?” and i ve explained that : “more detailed informations in the SE helps people make a better decison and while the click is more qualitative then the rebounds decrease and the time spent on the site grow up and then the rank is higher. The advantage is quality and not quantity. Very good presentation. I esp liked the 42nd slide on the 8 business models. Would LOVE to re-blog but it seems I can only use a TypePad blog. My existing blog uses another host. Can bloggers like you who are customers of TypePad encourage them to ‘open’ their tool to other blog hosts so that people like me can indeed re-blog your very interesting post?